In the last week, I’ve spoken with three men — three Alameda boys — who grew up in the neighborhood in the 1930s and 1940s. None of them live here any longer, though fragments of memories from their growing up years are crystal clear. We’ve been concentrating on overlapping memories about a single person and situation. Even though these three were all here, living just a couple blocks from each other, it’s interesting to see what has been remembered and what hasn’t. Our point of focus has been an elderly man who lived near NE 33rd and Shaver. Our timeframe is the 1930s. This man owned a dog — which is an important part of the memory — and was reportedly quite a character. One of our Alameda boys remembers him as living in an old home in the 33rd Street Woods, which was what everyone called Wilshire Park when it was just a wild patch of trees and brush. Another remembers him living in the big Craftsman (now painted yellow) near 33rd and Shaver, or possibly in a boarded-up house at 39th and Shaver, and that he owned the chunk of land south of Shaver from 33rd to 35th. Maybe he was here before all the commotion of development beginning in about 1910. Those fragments are not particularly clear. The third boy doesn’t remember him at all. 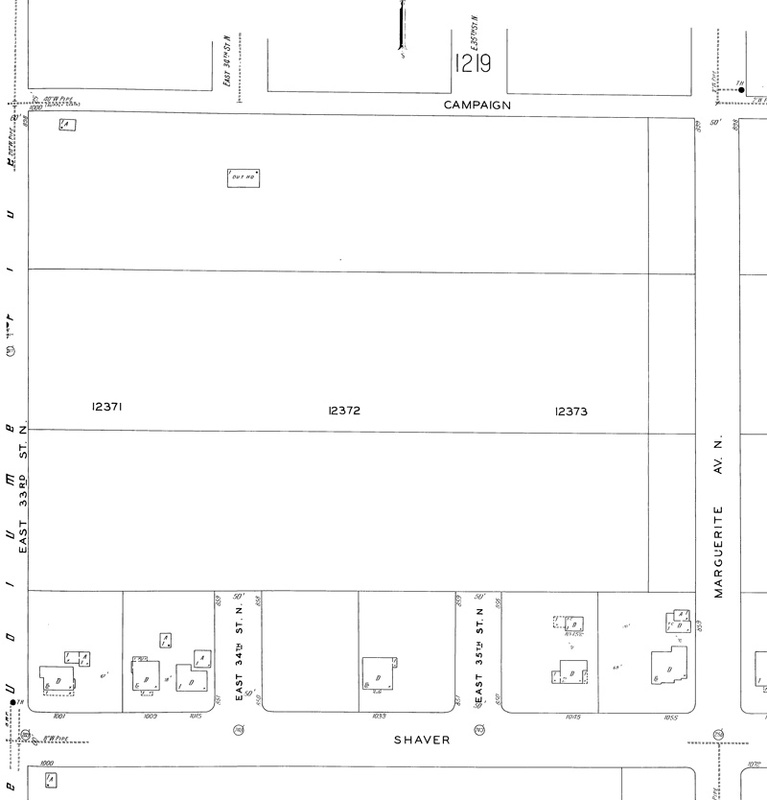 Here’s the Sanborn Map from 1924 that shows the 33rd Street Woods (now Wilshire Park). Note the outhouse situated in the northwest corner, and “Campaign Street” (now Skidmore). Marguerite Avenue is now NE 37th. This is a detail from Sanborn panel No. 1220. Click for a larger view. Here’s the story we’ve been reassembling from memory fragments: Reportedly, this old man used to walk through the neighborhood with his big dog, which one of the boys remembered as a “police-type dog.” He didn’t drive, so when he needed to travel somewhere, he would walk to the end of the streetcar line at NE 29th and Mason and wait for the Broadway Streetcar. Sometimes during these intervals, he would lay down and nap on the grass of the home at 29th and Mason (the turquoise one, which is a special house for other reasons…a subject for a future post). So — operating from reassembled memory fragments here — as the man slept sprawled out on the front yard, passersby grew concerned for his health and attempted to wake him, prompting the dog to bark and to bite. This apparently happened a good few times…enough that the police knew about the sleeping man and the big dog, and avoided being pulled into the situation. Was he Mr. Volk? Mr. Volkman? Mr Wilshire? His name was in the air, but not something that stuck with these 10-year-old boys. It’s been an interesting contrast this week. A good portion of my Alameda research centers on what has been documented in black-and-white: building permits, census data, newspaper clippings, plats. The human dimension — the memories and stories — is much more malleable, often more difficult to track down, and way more precious. Time is of the essence to capture these memories. Quick correction: “Marguerite Avenue” is now NE 35th Place rather than NE 37th. At least, in the Alameda area.